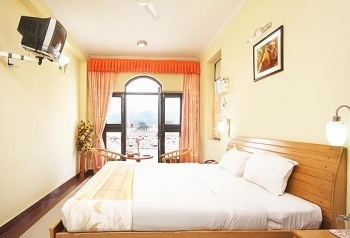 Sun hotel is a deluxe hotel in Haridwar and one of the finest hotel for travellers and tourists visiting holy city. It is situated near Har ki Pauri and close to Railway Station as well.The management and staff of Sun Hotel delivers best services to the guests. The staff is well trained,experienced and qualified to provide best services. Manage by Sun Group Hotels & Resort, the hotel offers best accommodation facility in Haridwar city. Located very close to railway station, the hotel is best choice for large groups and families. With all modern amenities and facilities, there is also an Ayurvedic Health Spa running numerous treatment programs. The hotel is located very near to Railway Station at Tulsi Chowk in Haridwar. The visiting places like Chandi Devi Temple, Mansa Devi Temple, Har ki Pauri, Sati Kund are situated near the hotel. One can visit these holy places and can take a holy dip bath in River Ganga. The hotel offers comfortable lodging at the perfectly fashioned rooms. The hotel provides accommodation in Deluxe, Super Deluxe and Premium Rooms. The contemporary styled hotel possess an authentic decor which catches the attention at once. The stately rooms are well furnished with modern amenities such as attach bathroom, hot/cold running water, A/C, internet access and 24 hours power backup. 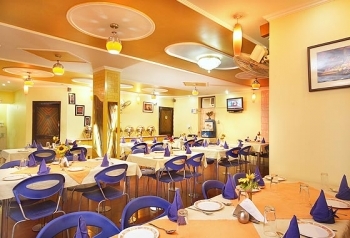 The hotel possess its own Indian Chilly Restaurant which serves an array of savor cuisines. The fine dining restaurant serves scrumptious multi cuisines to lure the jaded palates of the honourable guests. The restaurant serves healthy and pure vegetarian dishes at the authentic restaurant. The rich aroma of the tasteful dishes increases the appetite of the guests. By Air: If you are planning your journey to Haridwar by air, you need to board a flight for Jolly Grant Dehradun from Delhi Airport. Then you can hire a cab/taxi to cover remaining distance of 35kms. By Train: Haridwar railway station is well connected to various popular cities.If you are coming from Delhi, it will take around 4 to 5 hours by train to reach Haridwar. By Bus: The bus stop at Haridwar is just opposite to the railway station.You can book seats in hitech,volvo or oither buses as per your convenience. The buses are available from various parts of Northern India like Delhi, Punjab, Uttarpradesh, Rajasthan, Haryana.